Finally, you’ve locked the husband down for a weekend afternoon after three rounds of re-scheduling, and the family is ready for an afternoon session to capture your child in a myriad of themed outfits. That is, until he suffers a complete meltdown at the studio and refuses to even look into the camera. Sounds familiar? We’ve come up with five things you can do to prep your Tatling for a photoshoot sans panic and tantrum. Every child likes routines. And organising a photoshoot on a weekend afternoon when it’s usually time at the swimming pool is a big no-no in his or her rule book. So, start the mental prep a week before. Explain that everyone will be going for the shoot and that the photos will be for keepsake purposes—nobody stays a three-year-old forever, after all. Go through costume or outfit options with them and seek their opinion. From there, you’ll have an idea of their likes and dislikes. More well-established photography firms like The Studio Loft showcase options on their websites or Facebook accounts, which you can show to your little ones to get them excited. Don’t pay lip service. If a particular outfit or prop catches your child’s attention, think of how to incorporate it into your session. For instance, your child likes the giant donut prop in the sample photos. Let them take some photos with it, even if the look and feel may not gel with the rest. Always remember: With an interested child, the photography session will become more enjoyable and manageable. Chances of a tired or hungry child cooperating on set are low. If the child needs to nap, schedule the shoot after he or her wakes up. The same applies to meal times. Feed them before the shoot; a hungry child is usually an angry one, too. Don’t solely focus on the end product. Yeah, your child may be drooling or running around like a wild horse, but the best thing to do is embrace the chaos and just have fun. If you’re not very creative but want a unique photography session, then opt for themed shoots, which are made avail by some studios during occasions like Chinese New Year, Christmas and Children’s Day. At The Studio Loft, they prepare tailor-made props and sets for these shoots. Moreover, they make it a point not to repeat these props the following year. 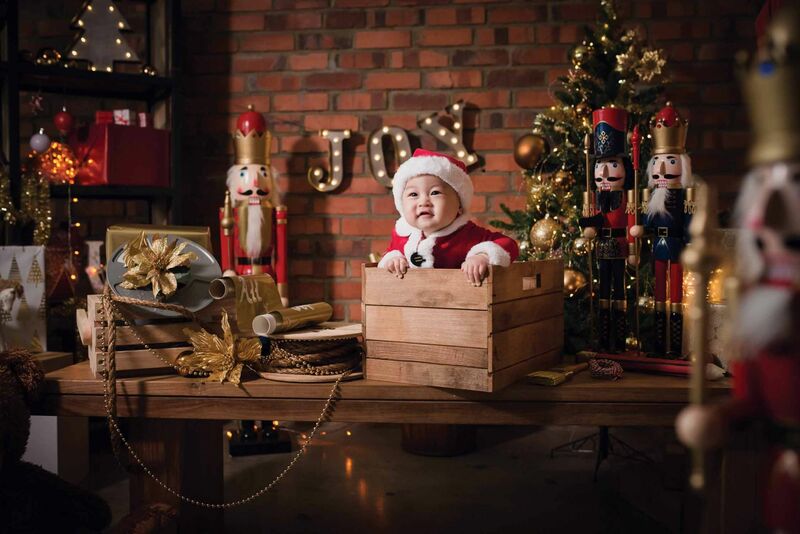 Compared to regular family shoots, which are done with minimal props on a light-coloured backdrop, their seasonal photography sessions are more elaborate—perfect for capturing special moments.